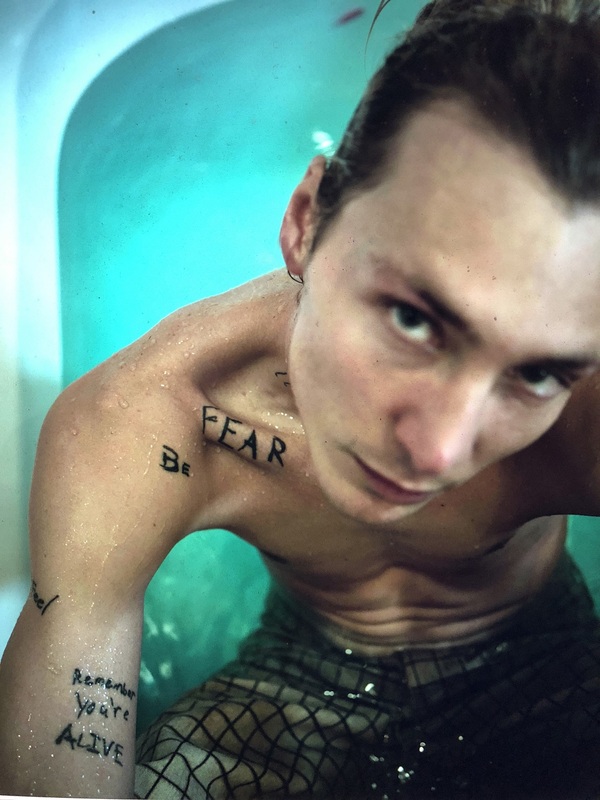 Jagwar Twin (aka Roy English) discusses his catchy alternative underdog anthem “Loser,” being true to yourself, and his debut album ‘Subject to Flooding. Catchy, meaningful, and connective, Jagwar Twin’s debut single “Loser” is one of the coolest songs I’ve heard in a long time. An alternative underdog anthem with a message of inclusivity and togetherness – I’m a loser, baby, just like you – “Loser” doesn’t just make it cool to be a so-called loser; it makes it cool to be anything – whoever you are, whatever you want to be. Everyone’s accepted just the way they are – which is exactly as it should be. “The world has never felt more disconnected in a lot of ways,” says Roy English, the mastermind behind Jagwar Twin. “But we have all the tools at our disposal to connect, at all times.” Based in Los Angeles and formerly known for the bands Dead Letter Diaries and Eye Alaska, Roy English donned the name Jagwar Twin as a reference to the ancient Mayan belief that jaguars possessed mythical powers to see into all living beings. English teamed up with producer S1 (Kanye West, Lorde) and rock producer Linus to develop Jagwar Twin’s musical identity — all of which led up to “Loser” and his debut album Subject to Flooding, released today, September 21, 2018! This is just the start of a very exciting, promising artistry full of wonder and potential. Jagwar Twin’s music is inclusive, indulgent, emotional, and highly expressive – all of which makes for a winning combination. English’s voice is fierce and raw; his lyrics cut to the core of whatever topic he’s focused on; and his riffs are utterly intoxicating. Chatting with Roy English, one gets the sense that he’s reached a higher plane of existence than most – that he’s had some spiritual enlightenment, and he has a deep understanding of his purpose in life. “Songwriting is filled with external influence, life, art, the world and it will forever be shifting, but this is the music I was always meant to make,” he reflects knowingly. Stream “Loser” and Jagwar Twin’s brand new debut album Subject to Flooding, out now, and dive deep into the music with Atwood Magazine’s exclusive interview as Roy English / Jagwar Twin shares his inspirations, influences, philosophy, and more! Atwood Magazine: Roy English, what inspired you to don the name Jagwar Twin? Jagwar Twin: There was a big transformation in my life prior to making this album. I felt like I was given new eyes and I started to see myself, others, and the world differently as a result. We’re all really mirrors to each other if we look, and during the writing and recording of the album me, Linus and S1 just felt weightless… almost like we weren’t even doing anything. The songs just felt like gifts or downloads, and they all connected with the same spirit of how we saw the world and humanity right now. It really felt like this whole project was something bigger than any of us individually, and that led to the genesis of the name. In Mayan mythology jaguars have the gift to see into themselves and others and we are all at war with ourselves trying to find equilibrium, hence Jagwar Twin. How did your years with Dead Letter Diaries and Eye Alaska inform your solo artistry? Jagwar Twin: Those years were incredible. I was just a kid in high school with no idea what I was doing and so many emotions I didn’t know how to release … until I found music. You only can see what you’ve learned looking backwards and during that phase I learned from so many different experiences. I got deep into what it meant to be a producer while working at Sound City with Matt Wallace and discovered the beginnings of how songs worked, on an emotional level at least. I worked with live orchestras for the Eye Alaska stuff, toured the country for a few years with 8 guys crammed in a white family van and found a love for the energy that is created inside a crammed venue full of sweaty humans uniting around music. We slept in Walmart parking lots, lived off ramen and $5 a day (on a good day), but it was beautiful. You set the bar high debuting with “Loser,” a song that embraces the title ‘loser’ - almost making it a point of pride. Why introduce yourself with this song. Jagwar Twin: We all spend so much time trying to make ourselves into what we think the world wants us to be but in the end we’re all humans underneath. Jagwar Twin is a collective consciousness and I wanted people to feel that from the first listen. I want everyone to feel like they are good enough just as they are, nothing more or less. It’s us, we, not me and we are all Losers. I want everyone to feel like they are good enough just as they are, nothing more or less. It’s us, we, not me and we are all Losers. Similarly, with regards to Subject to Flooding as a whole... On a record full of anthems and jams, why debut with “Loser”? Jagwar Twin: I wanted the rest of the album to be listened to with the baseline that we’re all the same. The rest of the album has layers and there’s a richer meaning in that context. It felt important to start from a place of reflection about our own insecurities and self-doubt. I hear alternative, electronic, rock, and decades’ worth of influences blending into your music. Can you describe your own musical upbringing? Jagwar Twin: I’m a product, like everyone else of our time. We have had an incredible access to all kinds of music since we were kids. Alternative music was where I first felt like I “fit in” somewhere so it will always have my heart but growing up I listened to everything from the Kinks, and the Stones, to Biggie, Earth Wind and Fire, a ton of orchestral stuff like Ryuichi Sakamoto and Harry Gregson Williams, to Blackstreet, Eminem, Nirvana. My mom listened to pretty much only weird world music. There’d be Celtic chants and amazing African drumming, Native American flute music. So yeah, a lot of things! But all of it had such a range of emotions that I pulled from. Along the lines of musical influences, how did you strive to incorporate the music you like into the music you make? Jagwar Twin: I don’t think about it. What’s inside you is bound to come out when you let it. Did you always want to make music like this, or were there other iterations of Roy English's music on the path to Jagwar Twin? Jagwar Twin: I’ve always loved music in every form and like life, my writing hasn’t been a straight line either. Alternative was my root and I spent most of my time there. I wrote an orchestral piece with a vocal called “Cool” and that orchestral song ended up being heard by a Swedish DJ Alesso, who completely flipped the music into something else but the vocal and the heart was still the same. Songwriting is filled with external influence, life, art, the world and it will forever be shifting but this is the music I was always meant to make. Songwriting is filled with external influence, life, art, the world and it will forever be shifting but this is the music I was always meant to make. At the heart of “Loser” lies a man and three chords. Can you describe the challenge of “simple” music writing, and how you worked with S1 and Linus (or others) to take that structure and present a captivating three-minute song? Jagwar Twin: That’s really the essence, isn’t it? Linus is such a genius because he understands that simplicity is the most important thing to the song. But with that every ingredient has to be great. Linus and I came up with the original idea of Loser over this dark dreamy kind of movie soundtrack vibe. Then one day he muted all the music and played this ’60s sounding guitar riff over it and we both heard it through a new lens that brought out the essence of the message. So it really was removing everything that brought it to life. “I’m a loser, baby, just like you,” you emphasize in the verses and chorus. How did these words come about, and why do you like them? Jagwar Twin: I believe in the power of words and also the limitations of language. It feels good to say, doesn’t it? There’s freedom in the repetition of that phrase. The more you tell yourself something out loud, the more you actually start to believe it. “I got sunshine in my mind, wake up and I’m feeling fine...” we hear in the pre-chorus. First off, why switch the vocalization there - does the decision go deeper than it sounding cool? - and secondly, what does it mean to have sunshine in your mind? Jagwar Twin: I’m really glad you brought up that vocal switch. It was definitely a conscious decision to use a choir of children. The pre-chorus is about getting back to that childlike self before people told you you were different… When you were just you, unashamed. But it’s just a state of mind and we can all get back to that place where we are seeing the world differently. The metaphorical sunshine in the mind is reprogramming inside ourselves to be more positive and loving. Elsewhere in “Loser” you sing, “I think the world’s gone insane.” This line sticks with me as well because it feels isolating - as if you’re embracing the commonality of being “losers” together as a means of having *something* to cling to, a lifeline of sorts. Can you speak to that? Jagwar Twin: The world has never felt more disconnected in a lot of ways. But we have all the tools at our disposal to connect, at all times. Your record is full of electronic manipulation, so I'd love to understand your voice as it extends beyond singing. Are you harmonizing and playing the guitar as well? Jagwar Twin: There’s a lot of vocal layering on this album. A lot of the harmonies were sung by me, but we had some other amazing singers, kids, friends, random people, come in as well and it created this whole new texture that we felt captured the uniqueness in humanity. Linus is also an absolutely incredible guitar player so he’s playing most of the guitars. I play guitar on a couple tracks and Julian Bell, Kyle Moore, Michael Morgan and a few others are featured as well. There were so many talented people that made this album what it is and everybody let go of ego to create something bigger than all of us as individuals. Similarly, what does your songwriting process look like? Do songs begin with production or do they start with a guitar melody / vocal line and evolve from there? Jagwar Twin: It’s different for every song. “Move to You” was like a download, I didn’t really write it … It felt given to me. I heard it all at once and scrambled to voice memo all the music, lyrics, and melodies out. But other times it’s Linus and I on guitar writing or it could be myself and a piano or just a vocal melody idea. For me, it’s important to always switch up the process that way I never get stuck in a rut and the creativity keeps evolving. It’s honestly more about creating the space to create. Going out to Joshua Tree with no cell phone, or being in Florence, or Haiti, or Ireland. The space is important. What is your personal favorite element of “Loser”? How does this song make you proud? Jagwar Twin: I love the fact that after feeling those emotions for so long when I was younger, I can hear people singing those words back to me and have a knowingness about how we feel together in that moment. Linus produced that song and he captured it perfectly. A song that makes being a “Loser” “cool” is always beneficial for those who feel bullied and alone: It’s a statement of inclusivity and togetherness, an underdog anthem so-to-speak. Again, why begin your story here, with this song and this message? How much of it is targeted at you (or perhaps your younger self) and how much of it is intentionally for younger/other listeners? Jagwar Twin: It’s about myself completely and it’s about the listener completely. When I say everybody’s all the same, I’m really speaking to the fact that we are all part of the same mind and body of a collective human consciousness. So my experience of being a loser and the listeners’ are one in the same. Starting with “Loser” was the only option, because it’s the lens to view the rest of the Jagwar Twin world through. When I say everybody’s all the same, I’m really speaking to the fact that we are all part of the same mind and body of a collective human consciousness. What have I missed? What’s your musical goal - how do you define success as far as your career is concerned? Jagwar Twin: I’ve already succeeded beyond anything society or numbers could calculate. Any “success” from big record sales, radio play, money, fame, are just something that can happen. Or not. I have so many beautiful people around me, the best friends, and family. I’ve already “made it” in my own being, but through this music I hope people will find energy and spirit in our shared humanity.